Want to have more fun with videos?Need more opportunities for visual expression?COLORCODE VJ is just the tool for you! Load, mix, and output movie files. You can move the images by touching on the screen, or preset the movement in advance. Like images, texts can also be moved. Play tracks in your iPad's library as BGM (*2). Works with most recent LCD TVs! (*1) The following adapters are supported: Apple Digital AV Adapter, Apple VGA Adapter, Apple Composite AV Cable. Select the cable to match your display. (*2) DRM protected tracks purchased on the iTunes Music Store cannot be played. iTunes Plus tracks are DRM-free and can be played. As part of a full-fledged VJ equipment set You can even get up on the stage with your iPad while VJing! COLORCODE VJ offers musicians a quick way to play movies in addition to their instruments. Take control of both music and images to add depth to your expression! Simply hook up your iPad to a TV or monitor and start VJing! With iPad 2, you can also show movies that were filmed with your iPad. A video slideshow? No problem! Simply hook up your iPad to a TV or monitor and start VJing! With iPad 2, you can also show movies that were filmed with your iPad. A video slideshow? No problem! While there are many presentation tools for iPad, COLORCODE VJ may be the one for you when a simple slideshow just doesn't cut it. Tweak your presentation to match the atmosphere for a successful presentation! Is an external display a must? Absolutely not! 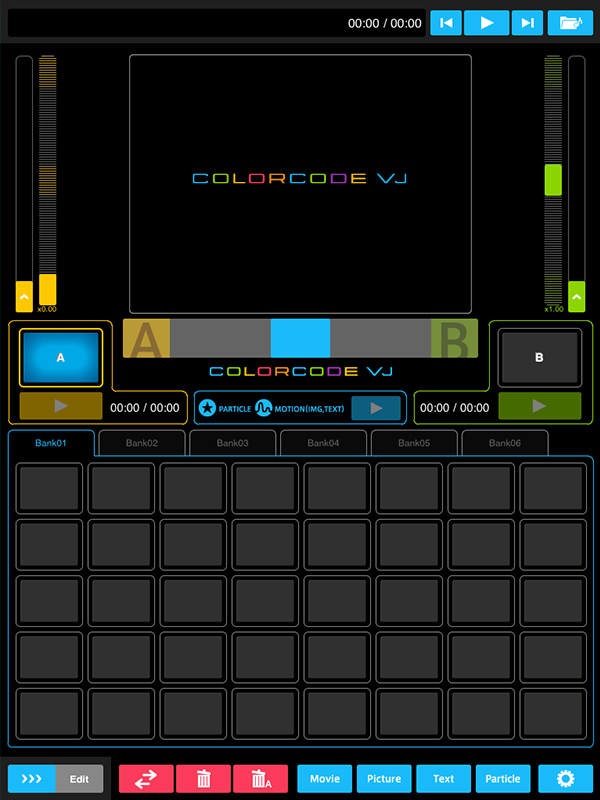 COLORCODE VJ will work perfectly fine with just your iPad. It's a lot more fun with an external monitor though! COLORCODE VJ has 2 modes of operation. 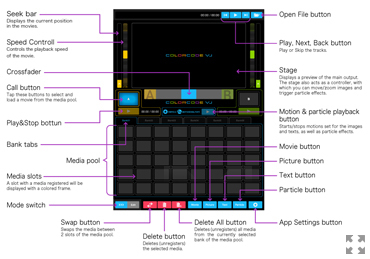 Edit mode for preparing your VJ play. Play mode for performing the actual VJ play. *Note that output to external display will be disabled under Edit mode. Movies and images provided with COLORCODE VJ are for use within the app only. Contact the respective creator if you wish to use the materials for any other purpose. DEVILROBOTS is a 5 men design team. Established in 1997, and based in Tokyo. Main works are graphics, character designs, audio-visual, web designs, toys, CD jackets, clothing, and more! A little evil and robotic fun is their taste, and the original world of "Cute and blackness" is in the effect. Symbolic character TO-FU OYAKO is well known world wide. Collaboration porcelain figure will be released by Lladro soon. VJ REEL is a video artist that continues to allure his audiences with his unique perspective and sensitive expressions. VJ REEL has collaborated with various artists as a VJ while producing commercials, music videos, computer graphics, and graphic designs. In 2008, VJ REEL participated in the world's first music performance in a stereoscopic dome theatre, which took place at Synra Dome of the Science Museum (Tokyo). Internationally, VJ REEL is a member of Lightrhythm Visuals, a VJ label hosted by Ben Sheppee, and in 2009, became the first Japanese VJ to participate in Primavera Sound, an annual music festival held in Barcelona, Spain. In 2009, VJ REEL founded REELVISION Co., Ltd., and in 2011, released "VAMS-01", an iPhone app developed in collaboration with blank records. An artist working primarily with motion direction, design, and video art, Takafumi Tsuchiya (a.k.a. Takcom) collaborates internationally on music videos, commercials, and broadcast design, and also participates actively in improvisational live performances. With a focus on cross-border expression, his works have been presented via dozens of international events and media, including onedotzero, Pictoplasma, Rojo Nova, and Stash, and are highly recognized by galleries, artists, and websites around the globe. Established in 2008, Tymote is a team of young creators born in the 1980s, and is currently active in a variety of fields, including graphics, video, music, and programming. A creator that rose to sudden fame in the world of GIF animations, mogmotion weaves his images using an array of tools including After Effects, CINEMA 4D, and Photoshop. mogmotion makes a policy of never taking shortcuts. "There really aren't any shortcuts. If I can make solid progress one step at a time, it's enough for me," says the artist as he laughs humbly. mogmotion's works cover a wide range of expressions from abstract motion graphics to simple stop motion animations, and more recently, experimentation with live action. After entering the world of motion graphics in 2006, Takuya Hosogane has established himself in various fields with works including his internationally acclaimed video 'Vanishing Point,' ending animation for "Yojouhan Shinwa Taikei" (animation category winner of Japan Media Arts Festival 2010), opening animation for WIRED's "Disruptive by Design" conference, eyecatches for "Design Ah" on NHK, and VJ performances using VDMX. A designer, illustrator, and VJ, Keitaro Maruhashi has been involved in many major events including FUJI ROCK FESTIVAL, ROCK IN JAPAN FESTIVAL, and WIRE. The artist continues to perform actively at WOMB (Shibuya, Tokyo) and various other locations. SUN&MOON inc. is a multifaceted design company involved in a range of businesses from graphic design to smartphone app development, and with particular strength in website production. With “working towards beauty in everyday life” as its corporate theme, SUN&MOON inc. continues to enjoy diversities and challenges. "Kappa Godaime" is the first film by CPP, a project founded to deliver creative works from Saga, one of the westmost prefectures of Japan. The film depicts the melancholic life of a middle age Kappa (a popular creature in Japanese folklore) using various expressions such as animation and figures. Visit the creator websites for more details. A music player that allows you to easily change the tempo or key. Suited for learning music by ear or for daily practices. Repeatedly a top seller in the Music category. Scan a QR code and jump to the coded URL. Convenient for visiting promotional websites spotted on the go. 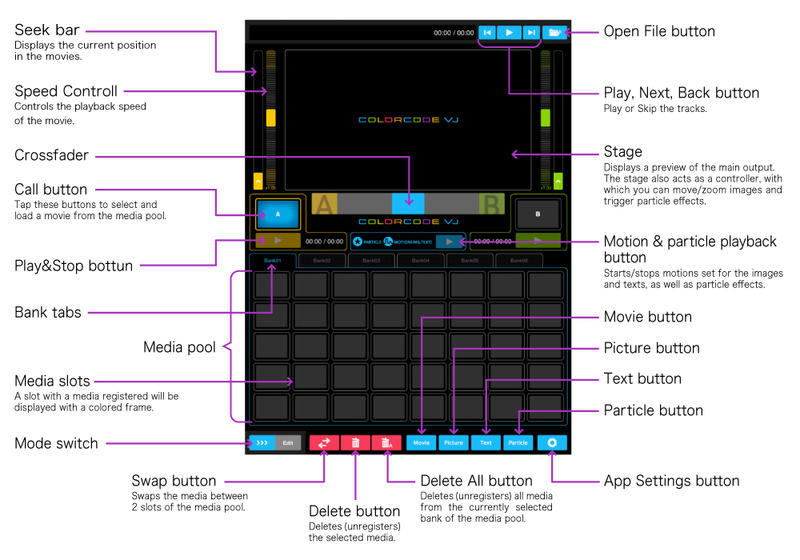 An integrated MIDI utility that combines several MIDI tools into a single app. Great for managing your data and devices.